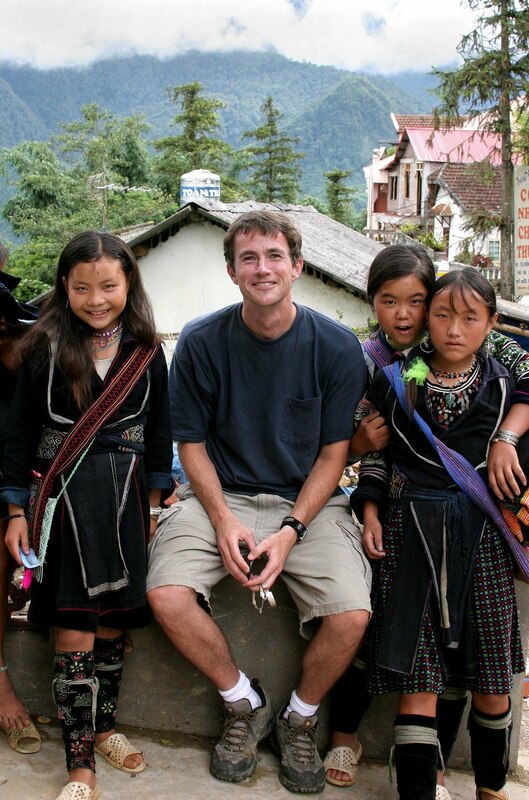 My visit to Sapa, Vietnam was the highlight of the trip I made to Southeast Asia four years ago. Sapa is a mountain town in the northern part of the country, very near the border with China. 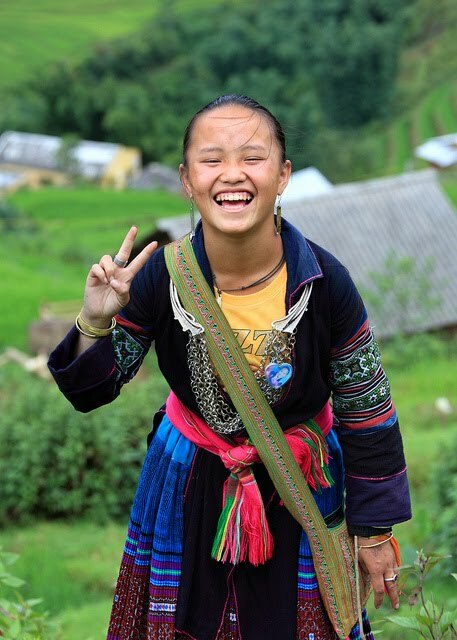 The surrounding hills are covered with terraced fields of rice and the countryside is populated with a variety of ethnic minorities – like the Black Hmong and the Red Dzao – who still wear the traditional clothes of their tribes. I admit, when I first arrived in Sapa (sometimes written ‘Sa Pa’) four years ago I was battling a bad mood that threatened to get worse. The night train most tourists take from Hanoi to Sapa is a confusing experience (for me, locating the right train station felt like trying to find the island on the TV show Lost), and by the time the train rolled into Lao Cai – a town near Sapa where the train tracks end – I was frustrated and sleep-deprived. A minivan took us the rest of the way, and when we finally pulled into Sapa the entire city was blanketed in a fog so thick that you couldn’t see more than 20 feet. As soon as I stepped out of the minivan a group of Black Hmong women surrounded me with trinkets and chanted, “You buy from me! You buy from me!” I had trouble finding a hotel, and as I walked along the street a truck honked a skull-piercingly loud horn right next to me, then it hit a puddle of muddy water that sprayed all over my shoes. I said in a previous post that when I feel a bad mood approaching I have two options: either retreat and lay low or make a conscious decision to fight. In Sapa that morning four years ago I chose to fight. With only a few days there, I didn’t have time to waste. I told myself that no matter who walked past me next I would smile, say hello, and be friendly. Just then two teenage Hmong girls appeared in the fog, carrying a variety of things to sell. Instead of ignoring them, I smiled, said hello, and asked them their names. That’s how I met Vi and Ge, who turned everything around. They spoke remarkably good English, and I remember being impressed when, as we stood there talking, they said hello in Japanese to passing tourists from Japan and then shifted to Chinese for tourists from China. All told, they probably spoke bits and pieces of at least seven languages: Hmong, Vietnamese, English, Japanese, Chinese, French, German, and maybe Korean. And their language skills came only from informal conversations on the street – none of it was taught in the local Hmong schools. 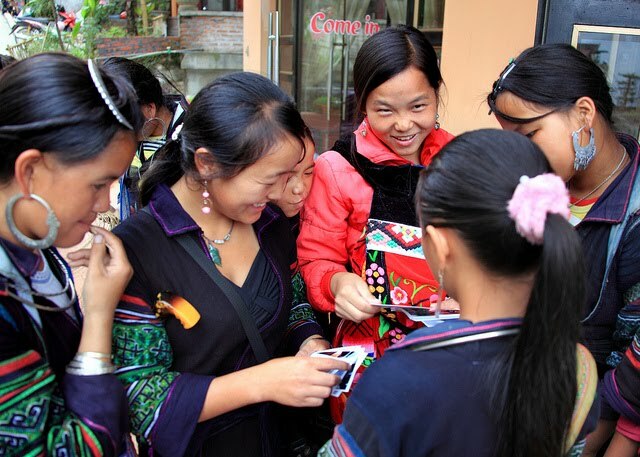 Vi and Ge did try to sell me their Hmong-made products – pillow cases, purses, bracelets, blankets – but to them selling seemed to be more of a game than a mission. They had a sense of humor about it. At some point I bought something small from each of them and said I wouldn’t buy anything else, and after that they never went in to sales mode again and even shielded me from assaults launched by other Hmong entrepreneurs. Eventually I met the rest of their gang – including Ya, Ya’s sister Chu, Chang, and Ge’s sister My – and I ended up hanging out with them for most of the three days I spent in Sapa. I had a blast. All of them were great sports about my constant “Can I take your photo?” requests, and most of my favorite shots from the entire trip include at least one of them. When I returned home I wanted to send them prints of some of the photos I’d taken, but none of them had a mailing address. The hotel I stayed at – the Cat Cat View Hotel – said I could mail the photos to the hotel and they’d deliver them, and I did that, but I had no way of knowing if the photos ever made it to the girls. So returning to Sapa is one of the things about this around-the-world trip I’ve been looking forward to most. The photo opportunities are amazing. The weather is so much cooler and nicer than most of the rest of Vietnam. And I thought I might have a chance to see my friends again. My plan for finding them was pretty simple. 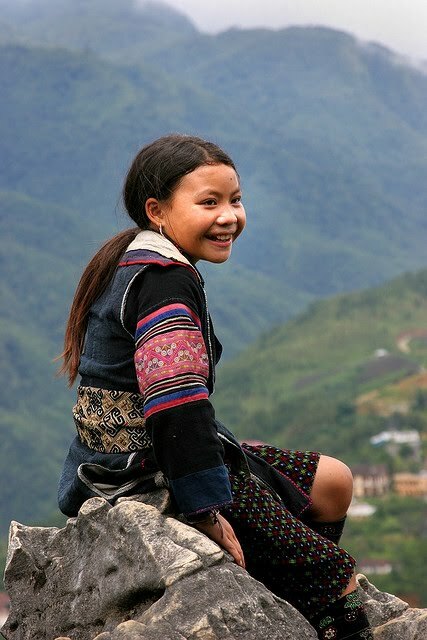 Given that I was bringing along a bunch of photos I took of the Hmong girls during my first visit, when I arrived in Sapa I could just show the photos to the nearest Black Hmong and ask if the girls were still around. 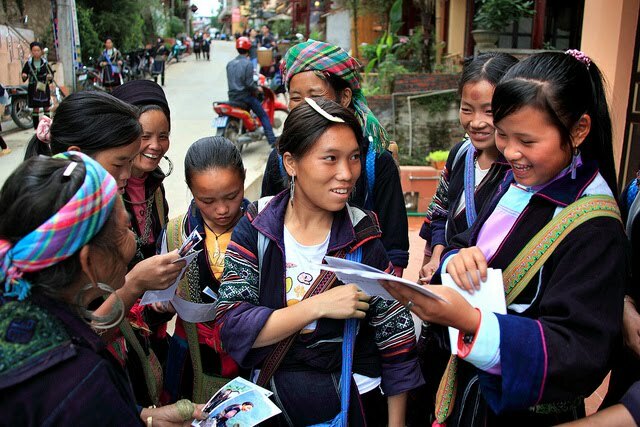 I had no idea if the girls still lived in the area, and when I told my plan to Duc – the Vietnamese student I met in Hanoi – he told me that the Hmong move around so frequently that the girls were likely gone. And even if they were still there, they might not remember me. They meet tourists constantly and four years is a long time. (It also crossed my mind that it might seem more than a little creepy for a 40-year-old American male traveling alone to be tracking down teenage Asian girls.) So I did what I could to keep my expectations low, although I still found myself looking ahead to Sapa as I worked my way north from Saigon. This time my experience getting to Sapa was similarly frustrating, but I was mentally prepared for the chaos and I could embrace it instead of wrestle it. I saw other tourists heading towards mini-meltdowns and assured them that everything would work out fine, which it did. I arrived in Sapa at about 8:30am Monday morning. My impression of Sapa after four years is that it’s fundamentally the same but everything has been cranked up several notches. More people, more hotels, more restaurants, more of everything. The crowd of Black Hmong who met our minivan as it stopped in front of the hotel was twice as big as it was when I first visited. I didn’t spot any familiar faces but just seeing the traditional Black Hmong outfit made me happy. I checked into the hotel and almost immediately headed out into the street, armed with my photos. Selling mode was immediately replaced by big smiles and enthusiastic offers to help. I passed around the photos and the women recognized the girls right away. “Ge works in there!” said one, pointing to the Cat Cat View Hotel, where I was staying. “And Vi works there!” said another, pointing to the hotel next door. They dispatched a runner to locate Ya and Chang, who they said were up the street, and one of them called Chu on her cell phone. Within 20 minutes I was saying hello in person to Ya, Chu, Ge, and Chang. Vi’s mom happened to be there and she told me that Vi was out of town serving as a local guide for a tourist trekking group, but that she’d be back tomorrow or the next day. 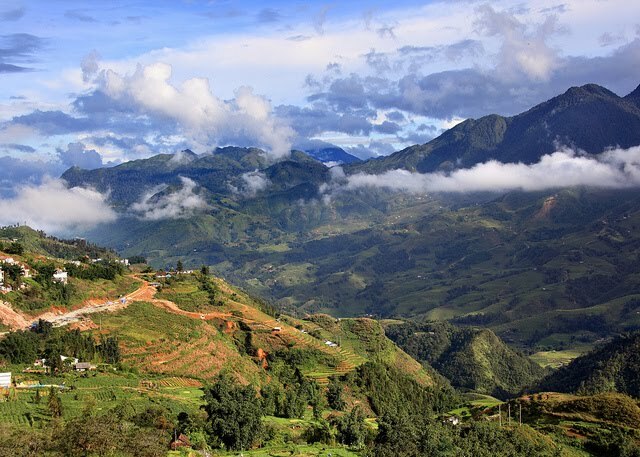 And someone said that My was living in her village and rarely visited Sapa these days. Really, really fun to see them again. The whole group passed the photos around, laughing and pointing. It turns out they had already seen most of them – the Cat Cat View Hotel was as good as its word and made sure the photos I mailed were delivered to the girls. After only one hour, Sapa had already exceeded very high expectations. 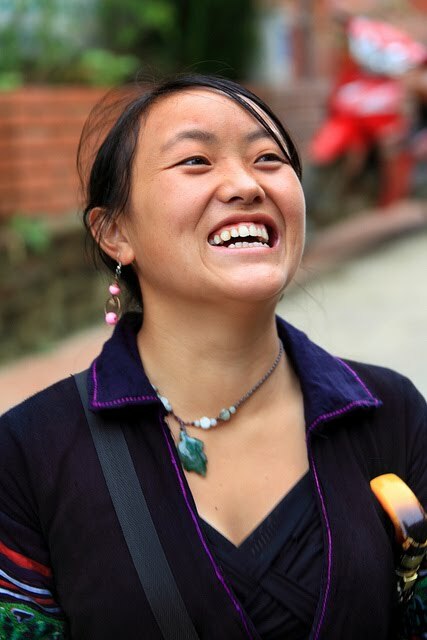 Hi.. can you tell me what month was your visit to Sapa. I’m planning to go next March, do you think the view will be this awesome? Hi Diana – the photos in this post are from August, but more recently I was there in May (https://endlessloopphotography.com/2016/05/19/sapa-vietnam-part-1-2/). Maybe those photos will be closer to what it will look like in March. Have a great trip!